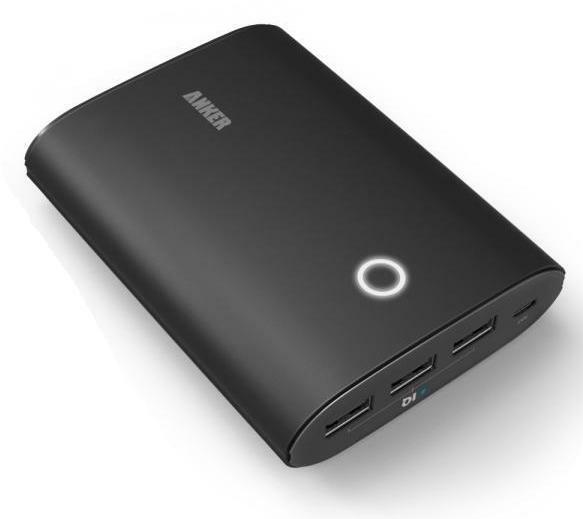 If you need to recharge your mobile phone or another portable device on the go, take a look at the Anker Astro portable batteries. 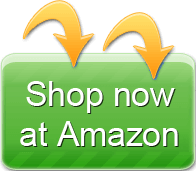 You can choose from several different batteries to find one that matches your needs. 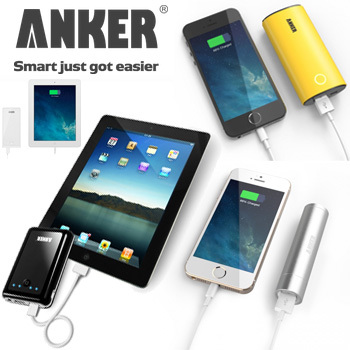 View our Anker’s comparison summary chart. Currently in its second generation, the baseline Astro series of batteries – Astro1, Astro2, and Astro3 – provide medium to high capacity in a relatively small form factor. Battery capacity is measured in milli-amp hours (mAh), and you can compare the capacity of a portable battery against the capacity of the device you want to charge. 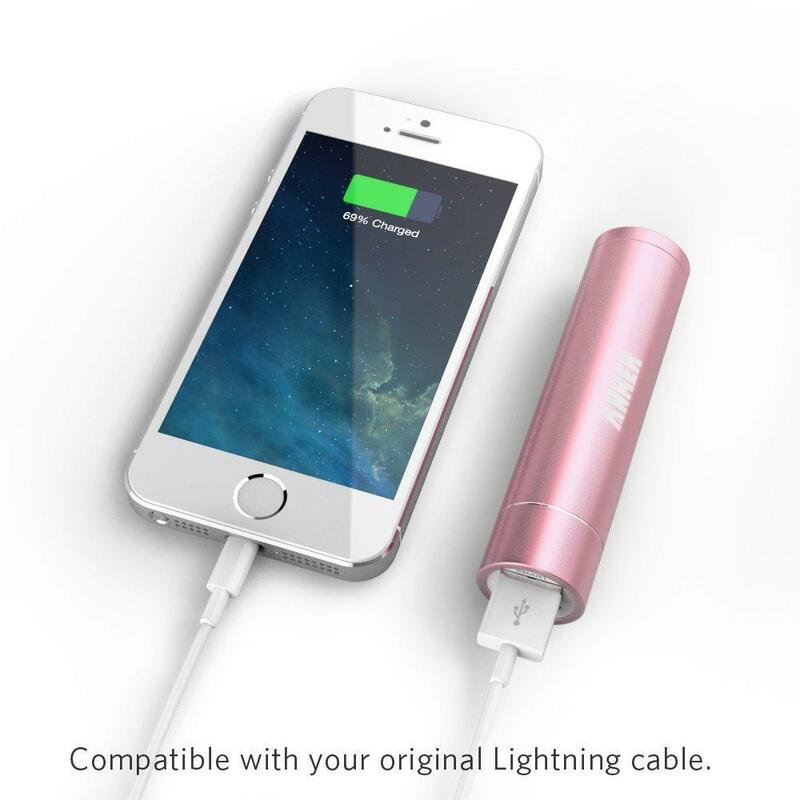 For example, an iPhone 5 has a capacity of 1,440 mAh, so a 6,000 mAh portable battery can fully charge it a bit more than three times. For comparison, one of the largest mobile device batteries on the market is the 11,666 mAh battery in the iPad 3. As with all the Anker batteries reviewed here, higher model numbers mean higher capacity – topping out at 12,000 mAh for the Astro 3. On the other hand, higher capacity also makes the battery somewhat heavier and larger. 6,400 mAh, 4.8 ounces weight, 3.7 inches tall by 1.8 inches wide by 1.0 inches thick, and containing a single two-amp USB charging port so it can charge a modern smartphone at full speed. Available in three colors: yellow, green, and black. 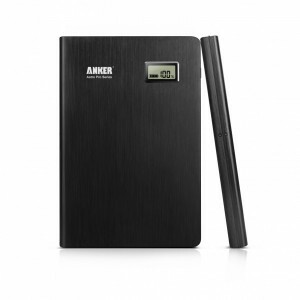 Click here to calculate how many times this battery will charge your device. 9,000 mAh, 8.8 ounces weight, 4.2 inches tall by 2.5 inches wide by 1.0 inches thick, and containing two USB charging ports providing up to a total of three amps so it can simultaneously charge one modern smartphone at full speed and another standard USB device at full speed. Only available in black. 12,000 mAh, 14.4 ounces weight (a bit under one pound), 4.4 inches tall by 3.3 inches wide by 1.0 inches thick, and containing three USB charging ports providing up to a total of four amps so it can simultaneously charge up to two modern smartphones at full speed. Available in either black or white. Although the Astro-series batteries (and the other batteries described below) will charge almost all devices (all iPhones, iPads, Galaxy S5 S4, Tab 2, Note 3 2, LG G3, Nexus 5 & 4, HTC One M8, MOTO X, PS Vita and More), there are a few devices they won’t work with. In particular, they do not support the iPod Nano, some Asus tablets, the LG G2, some GPS devices, Sony eReaders, and some Bluetooth headset-style devices. 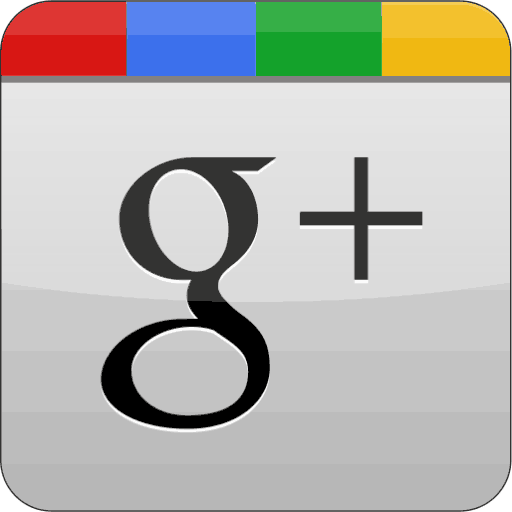 They do work with almost all other Apple products and major Android-compatible devices. The major improvement in the second generation devices is increased charging efficiency, going from 70% previously to the new 80%, meaning a 10,000 mAh device provides about 1,000 extra mAh of power to the devices it charges. The other difference in the Astro devices is that they no longer have a button—instead you shake them to start charging or to see how much battery they have left. Yes, but it takes several thousand shakes to drain the battery even 1%. No, you can’t charge a computer through a USB port, and even if you built an adapter, all Astro portable batteries only output 5 volts, which is much too low to charge even typical netbooks. These batteries are only for phones, GPS, tablets, and other small devices. The E-series focuses on providing more capacity so you can use them to fully recharge devices with larger batteries, such as iPads and other tablets. 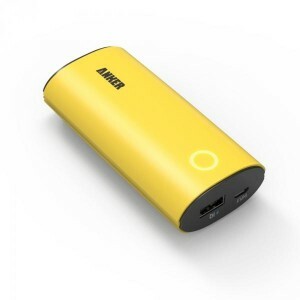 Currently in transition, some of the devices being sold as new in the E-series are first-generation Anker devices getting about 70% power efficiency and some are second-generation devices getting closer to 80% efficiency. 10,000 mAh, 8.1 ounces weight, and 5.3 inches tall by 2.5 inches wide by 0.6 inches wide. Available in either black or white. Includes cable. 13,000 mAh, 10.6 ounces weight, and 4.9 inches tall by 3.0 inches wide by 0.9 inches thick. Available in either black or white. Includes cable. 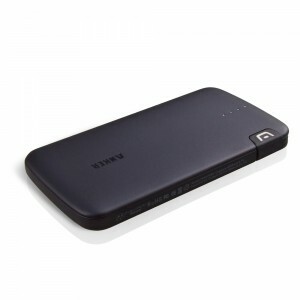 16,000 mAh, 10.8 ounces weight, and 4.9 inches tall by 3.0 inches wide by 0.9 inches thick (the same as the E4). Available in either black or white. Includes cable. Whatever generation the battery is, the form factor and charging rate is the same—all three E-series devices contain two USB charging ports that provide up to three amps of power, so you can charge up to one Apple Lightning or high-capacity Android device at full speed plus charge another device at standard USB charging speeds. A common complaint against the E3 and other Astro devices is that that they can’t be charged at the same time they’re charging another device. This means that if you want to charge both your Astro and your mobile device, you need to connect both devices separately to a wall charger or computer USB ports. 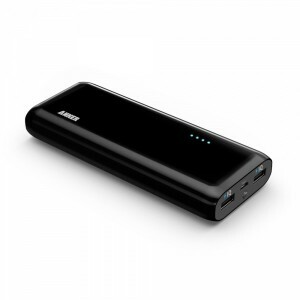 You’ll lose between 5 to 10% charge a week, so if you just want to keep an emergency backup battery in your backpack or purse, you can charge it just once a month. The Astro E3 (second generation) does include the adapter. The E4 and E5 (first generation) do not, but they may when they’re updated to the second generation. No. A cord is included that you can connect to a standard computer USB port for charging; you can also connect the cord to wall plug or car accessory that provides USB power. The two key features of the Astro Slim-series batteries are a slim size and a built-in micro USB charger cable, making these ideal devices for people who want a highly portable battery. 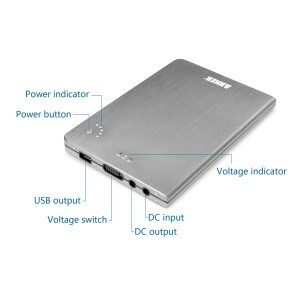 In case your mobile device won’t charge from a micro USB port, the Slim-series batteries also include a standard full-sized female USB port to which you can connect any USB charger. 4,500 mAh, 4.0 ounces weight, and 4.9 inches tall by 2.5 inches wide by 0.4 inches thick. Available only in grey. Includes a built-in, non-removable micro USB cord. 6,000 mAh, 7 ounces weight, and 5.3 inches tall by 2.7 inches wide by 0.5 inches thick. Available only in grey. Includes a built-in, non-removable micro USB cord. Unlike their larger cousins, Slim-series devices only deliver one amp of charging power, so high-capacity devices like recent mobile phones and tablets will take a very long time to charge – or may even continue to discharge faster then they get recharged if you continue using the device during the charging. No. Many recent Apple devices use non-standard charging connections, so you need to use the Apple cord. The Astro Slim-series devices have a port you can connect to the cord, so you simply need to remember to bring your cord with you. Six inches – too short to easily use the device on the go while charging, but long enough if both the portable battery and the device are sitting on a desk or other flat surface. The Slim-series devices do not include a charger or charging cord, so you need to provide your own micro USB cord which you can connect to a computer or USB wall charger. Not a series but just a single device, the Astro Mini is the ultimate portable battery. The size and shape of a small flashlight, it holds a reasonable 3,200 mAh—just enough to fully charge most modern mobile phones or give you an hour or more of heavy use on many tablets. It weighs only 2.6 ounces. 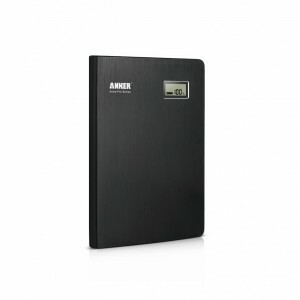 Like the Slim series, the Mini only provides one amp of charging power, so it won’t be very effective at charging power-hungry devices such as iPads—but if all you need is an tiny emergency battery for days when you forgot to charge your phone or GPS device, this is probably the right device for you. 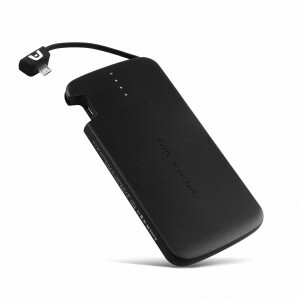 About four hours to charge the portable battery and up to four hours to fully discharge it into your device. 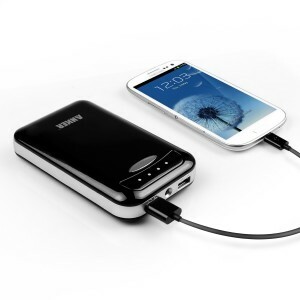 If your device has a smaller battery than the portable battery, it’ll charge faster. All the Astro-series devices are rated for a minimum of 500 full charge cycles—or about 16 months if you use it every day. Yes. Like all lithium-ion batteries, it must not be left in a hot place (such as a car glovebox), must be recycled properly (the lithium inside the battery is a toxic heavy metal), and should not be used if the case gets damaged (the battery is under pressure and can explode if damaged extensively). When you really need a lot of extra energy capacity in a relatively small package, the pro-series is what you want. Going up to 20,000 mAh, these devices can fully charge any portable device on the market at least once, and can charge smaller devices like iPhones enough times to get you through a camping trip lasting a week or more. 15,000 mAh, 13.6 ounces weight, and 5.8 inches tall by 3.9 inches wide by 0.6 inches thick. Comes in black aluminum. Includes cord. 20,000 mAh, 17.0 ounces weight, and 6.6 inches tall by 4.5 inches wide by 0.6 inches thick. Comes in black aluminum. Includes cord. These high-capacity devices come with their own special charger cord – which is both good and bad. On the upside, the device-specific cord allows it to charge several times faster than a typical USB device. On the downside, you need to carry an extra wall charger and cord with you if you plan to charge the device away from home, such as when you go on vacation. Both the Pro and the Pro 2 include three USB charging outputs providing up to 3 amps each, so you can charge even a power-hungry iPad 3. All of the Astro portable batteries include a display that indicates how much power remains in the battery, with the smaller Astro devices like the mini having a rough indicator that uses a few LED lights. The Pro-series batteries instead have a small LCD indicator that displays an actual number, from 1% to 100%, so you know exactly how much charge remains. Maybe. The Pro and Pro 2 can provide 9 or 12 volts of power and up to 4.5 amps, which is enough to charge some small laptops (such as netbooks). However, you will need to buy a separate universal D/C adapter cable and then make sure you use it correctly. Yes, but once again you will need to buy an extra cord. The 12 volt/2 amp D/C input for the Pro-series batteries matches the 12 to 13 volts provided by many solar panels. Batteries lose charge fastest when they’re most full, so you’ll lose about 1% charge per day for the first couple weeks and then the amount will decrease steadily. In theory, it will take about 18 months to two years for the device to discharge fully if you don’t use it at all, but charging it back up to full every 3 months or so may increase its lifespan. 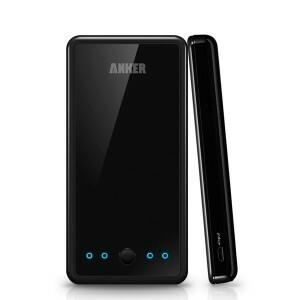 Although they’re slightly less efficient than the second-generation models described previously, some first-generation Astro portable batteries are still for sale, including the original Anker Astro battery—one of the best-selling portable batteries ever sold. 5,600 mAh, 4.4 ounces, 3.7 inches tall by 1.7 inches wide by 0.9 inches thick, and containing a single one-amp USB charging port sufficient to charge low-capacity USB devices at full speed. (With only one-amp, it cannot charge modern smartphones or tablets at full speed—however, it can help keep them going.) Available in black with silver highlights. Includes cord. 20,000 mAh, 19.8 ounces, 7.2 inches tall by 4.9 inches wide by 0.6 inches thick, and containing a single two-amp output that can charge modern smartphones and tablets at full speed or near-full speed. (Some devices today take up to three amps.) 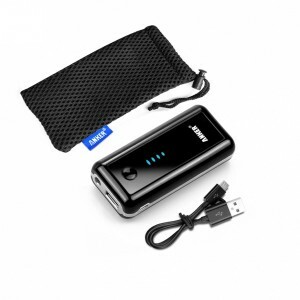 It can also charge small laptops which take 19 volts or less. It does not include a text LCD indicator like the second-generation version. Available in brushed aluminum. Includes cord with interchangeable connector tips for many different brands of laptops. Note: you must be careful using the first-generation Pro 2—it has a voltage selector switch which must be set correctly or you could damage the device you’re attempting to charge. This is not a problem if you only use it to charge USB devices. It does work—but you must turn on the device first by pressing the power button after connecting your USB cord. The D/C port turns on automatically when you connect a device, but the USB port does not, which can be confusing. No. The battery has an automatic short-circuit detector in it and it shuts down when this happens. To reactivate the device, recharge the it like normal for a few seconds until the lights come back on. Second-generation batteries tend to be smaller for the same amount of capacity and are about 10% more efficient at charging, which is like getting 10% more capacity for free. However, if a slightly larger and slightly less efficient battery is acceptable for your purpose, you may be able to get a first-generation battery on sale. 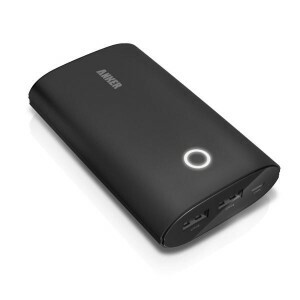 Whether you go for the tiny 3,000 mAh Astro Mini or the amazing 20,000 mAh Astro Pro 2, the Anker Astro portable batteries are an excellent way to keep your mobile phones and other portable devices from running out of battery at the worst possible time. Thanks for breaking down the Anker models! This is better information than on the Anker website itself.